To Cite: Shariatzadeh H, Jafari D, Najd Mazhar F, Taghavi R, Dehghani H. Outcomes of Sauve-Kapandji Procedure for the Management of Post-Traumatic Disorders of the Distal Radioulnar Joint, Shafa Ortho J. 2018 ; 5(4):e84692. doi: 10.5812/soj.84692. Background: Several procedures have been described for the management of post-traumatic disorders of the distal radioulnar joint (DRUJ). Amongst them, Sauve-Kapandji (SK) procedure has shown promising results; yet, it is not infallible. Here, we evaluated the radiologic and clinical outcomes of the SK procedure in eight patients with post-traumatic disorders of DRJU. Methods: In a retrospective study, patients with post-traumatic derangement of the DRUJ that underwent the SK procedure were included. The radiologic outcomes were evaluated using the assessment of union, ulnar variation, and radial deviation. The forearm range of motion and Mayo Modified Wrist Score (MMWS) were used for the clinical evaluation of the outcomes. The grip strength of the injured hand was compared with the grip strength of contralateral hand. Results: The mean extension, flexion, supination, and pronation of the patients were 67.5°, 65°, 77.5°, and 78.1°, respectively. The mean ulnar and radial deviations were 20.6° and 17.5°, respectively. The mean grip strength was 45.6 ± 14.1 Ib for the injured hand and 75.4 ± 30 Ib for the non-injured hand (P = 0.012). The mean MMWS was 83.8 ± 5.2. Based on the MMWS, the functional outcome was categorized as excellent in two patients, good in five patients, and fair in one patient. At the last follow-up, radiologic union was observed in all the patients but one. No other complications were recorded. Conclusions: The SK procedure could result in acceptable radiologic and functional outcomes for the management of post-traumatic DRUJ problems. However, it might compromise some indices of the forearm such as grip strength. Copyright © 2018, Shafa Orthopedic Journal. This is an open-access article distributed under the terms of the Creative Commons Attribution-NonCommercial 4.0 International License (http://creativecommons.org/licenses/by-nc/4.0/) which permits copy and redistribute the material just in noncommercial usages, provided the original work is properly cited. Fractures of the distal radius may result in several complications in the distal radioulnar joint (DRUJ) including ulnar pain, instability, subluxation, dislocation, reduced range of motion, post-traumatic osteoarthritis, and positive ulnar variance (1). Because of the broad spectrum of pathologies of this region, a variety of procedures have been described for the management of derangement of the DRUJ (2), of which Sauve-Kapandji (SK) procedure has shown promising clinical and radiologic results over a long period (3-5). The SK procedure that was described in 1936 includes arthrodesis across the DRUJ, resection of nearly 15 mm of the distal ulna, and creation of a pseudarthrosis of the ulna proximal to the fusion to restore the pronation and supination (6). As the distal radioulnar and ulnocarpal ligaments are preserved, ulnar support of the wrist will be maintained through the SK procedure. The aesthetic appearance of the wrist is also preserved following the SK procedure, as the normal prominence of the ulnar head, most noticeable in pronation state of the forearm, is preserved (7). Consequently, the SK procedure has been used in the treatment of many DRUJ disorders including rheumatoid arthritis, osteoarthritis, and various posttraumatic complications (7). Even so, like any other surgical technique, the SK procedure might have complications as well. The most potential complications of the SK technique include delayed union or non-union of the arthrodesis, painful instability at the proximal ulnar stump, and osseous or fibrous union at the pseudoarthrosis (7). Moreover, it is probably contraindicated in some cases such as treating the unstable or frankly subluxated or dislocated DRUJ (8). Besides, there is still some ambiguity regarding the optimal age of the patients undergoing this procedure. While some studies have argued that poorer bone stock and skin condition of older adults compromise the SK procedure, others have revealed poor results within a younger population (9). Descriptive studies of outcomes of the SK procedure are valuable approaches to further codify the indications and contraindications for this procedure. Thus, we here report the clinical and radiologic outcomes of the SK procedure in eight patients with disorders of the DRUJ following traumatic fracture of the distal radius. This study was approved by the review board of our institute and informed consent was obtained from the patients before their participation in the study. In a retrospective study, patients with post-traumatic derangement of the DRUJ that underwent SK procedure at our center from January 2015 to October 2017 were included in this study. The SK procedure was implemented for patients if the administration of non-steroidal anti-inflammatory medications, hand therapy, or occupational therapy had not relieved the localized pain of the DRUJ. Moreover, only patients with high demands on hand function underwent the SK procedure. All the surgeries were performed by one fellowship-trained hand surgeon. Patients with etiologies other than trauma such as rheumatoid arthritis and osteoarthritis were excluded from the study. Patients who were not available for the final radiographic and clinical examinations were excluded from the study (three patients) as well. Moreover, patients with the follow-up of fewer than three months (one patient) were not included in the study. Finally, a total of eight patients were included in the final study. The preoperative and operative information were extracted from the patients’ medical records. The radiologic outcomes were evaluated using the assessment of union, ulnar variation, and radial deviation. The objective assessment of the outcomes was performed through the evaluation of range of motion and grip strength. The range of motion was assessed using a goniometer (Hydraulic Pinch Gauge, SH5005, SAEHAN Corporation, Korea) and grip strength was measured by a dynamometer (Hydraulic Hand Dynamometer, SH5001, SAEHAN Corporation, Korea). Grip strength of the injured hand was compared with the grip strength of the contralateral hand. The combined subjective and objective assessment of pain, function, range of motion, and grip strength was obtained based on the Mayo modified wrist score (MMWS) with a range of 0 - 100 points (10). Accordingly, a score of 90 to 100 points was regarded as excellent, while scores of 80 to 89, 65 to 79, and < 65 points were considered as good, fair, and poor outcomes, respectively. Range of motion, grip strength, and MMWS were assessed at the last follow-up session. The SK procedure was performed as previously described with some modifications (6). The surgery was carried out with the patient in the supine position under general anesthesia and tourniquet control. Briefly, through a dorsal exposure, a longitudinal incision of about 6 cm was made over the sixth extensor compartments. The fifth extensor compartment was opened and the extensor digiti quinti tendon was retracted. The extensor retinaculum and DRUJ capsule were raised as an ulnar-based flap. Two parallel guidewires were inserted into the head of extensor carpi ulnaris sheet. Subsequently, using an oscillating saw, the periosteum was excised around the ulnar neck and 1 cm of the ulnar neck was resected. The wires were driven into the radius, and adequate alignment was checked with fluoroscopy. Based on the size of distal ulna, either two cannulated screws with the sizes of 2.7 and 3.5 mm (Figure 1A and 1B ) or one pin and one cannulated screw with the sizes of 1.5 mm and 3.5 mm in diameter (Figure 1C and 1D), respectively, were used for the fixation of the distal ulna to the distal radius. Cancellous chips from the removed ulnar segment were inserted into the sigmoid notch to help the solid fusion. The ulnar stump was stabilized using the Breen and Jupiter tenodesis technique (11). Then, the capsule was repaired and the pronator quadratus muscle was interposed into the osteotomy site. After the surgery, the wrist was immobilized in a below elbow cast for two weeks. After two weeks, the dressing and sutures were removed and the patient was provided with hand therapist guidelines. A removable wrist orthosis was used for six additional weeks. Light strengthening exercises were started eight weeks after the surgery. Heavy lifting and forceful forearm torque were avoided for three months after surgery. SPSS version 16 was used for the descriptive and analytical assessments. Descriptive statistics were presented as the mean ± standard deviation (SD) or number and percentages. Comparison of grip strength between the involved and non-involved hands was performed using Mann-Whitney U test. P value less than 0.05 was considered significant. Eight patients with post-traumatic derangement of the DRUJ and the mean age of 24.5 ± 7.9 years (range 16 - 39 years) were included in this study. The mean follow-up of the patients was 15.1 ± 11.9 months (range 3-33 months). The patients’ population consisted of 4 (50%) males and 4 (50%) females. The injury was dominant in 3 (37.5%) patients and non-dominant in 5 (62.5%) patients. The main indications for the SK procedure were pain, decreased range of motion, and DRUJ instability. Fixation device was two screws in 4 (50%) patients and one screw and one pin in the other 4 (50%) patients. The mean time interval from initial injury to the SK procedure was 3.1 ± 4.4 years (range 1 - 14 years). The clinicodemographic and surgical characteristics of the patients are demonstrated in Table 1. Abbreviations: ROM, range of motion; DRUJ, distal radioulnar joint. The mean extension of the injured hand was 67.5° ± 4.6° (range 60° - 70°). The mean flexion of the injured hand was 65° ± 7.5° (range 50° - 70°). The mean supination of the injured hand was 77.5° ± 5.3° (range 70° - 85°). The mean pronation of the injured hand was 78.1° ± 7° (range 65° - 85°). The mean ulnar deviation was 20.6° ± 6.8° (range 10° - 30°). The mean radial deviation was 17.5° ± 3.8° (range 15° - 25°). The mean grip strength was 45.6 ± 14.1 Ib (range 30 - 72 Ib) for the injured hand and 75.4 ± 30 Ib (range 40 - 115 Ib) for the non-injured hand. This difference was statistically significant (P = 0.012). The mean MMWS was 83.8 ± 5.2, ranging from 75 to 90. Based on the MMWS, functional outcomes were categorized as excellent in two patients, good in five patients, and fair in one patient. The outcome measures have been demonstrated in detail in Table 2. Abbreviation: MMWS, Mayo modified wrist score. At the final follow-up, radiologic union was observed in all the patients but one (case 3; Figure 1A and 1B). This patient had no complaint and thus no intervention was made. No subluxation was observed in our patients, and no other complications were noticed as well. It is unlikely to completely restore the normal anatomy or function of the DRUJ once it is deranged as a result of a fracture. For this reason, several techniques including arthroscopic debridement, Darrach resection, Bowers interposition arthroplasty, and SK procedure have been introduced (2). The SK procedure can correct excessive positive ulnar variance by shortening of the ulna and is able to restore rotation of the forearm by creating a pseudarthrosis. Retention of the ulnar head in the SK procedure secures an anatomic transmission of loads across the wrist, supports the carpal condyle and to the extensor carpi ulnaris tendon, and maintains the normal appearance of the wrist. These characteristics have made the SK procedure an interesting option for hand surgeons. Yet, some authors believe that the SK procedure is a salvage technique for very complex problems of the DRUJ (3, 9, 12), as it is not infallible. Thus, further codification of this technique for its indications and contraindications is crucial. Here, we evaluated outcomes of the SK procedure for the treatment of post-traumatic DRUJ problems in eight patients. The SK procedure provided an acceptable range of motion along with favorable radiologic and clinical outcomes in the patients. The mean extension, flexion, supination, and pronation were 67.5°, 65°, 77.5°, and 78.1°, respectively. The mean MMWS of the patients was 83.8. The functional result was fair in one patient and good or excellent in the others. None of the patients in this study needed a revision surgery at the mean follow-up period of 15.1 ± 11.9 months. However, the grip strength of the injured hand averaged 60% of the unaffected side that was a significant reduction. Jacobsen and Leicht evaluated the results of the SK procedure for the management of post-traumatic disorders of the DRUJ in 20 patients at a mean follow-up of 76 months. The mean postoperative supination and pronation of their patients was 70° and 86° that was comparable to our study. The patients scored an average MMWS of 77 points that was comparable to our results as well. Accordingly, functional outcome was poor in only one of their patients. The grip strength of the injured hand averaged 77% of the contralateral hand that was superior to the grip strength of our patients. In line with our study, they reported no major complications in their patients. However, only eight patients had returned to their original occupation in full capacity (9). Carter and Stuart also evaluated outcomes of the SK procedure for post-traumatic disorders of the DRUJ in 37 patients at a mean follow-up of 32 months. According to their results, pain improved in 25 of the 37 patients. Range of motion of the forearm returned to within 7 degrees of the uninjured side. According to their results, age was not a contraindication for this procedure (3). Voche et al. evaluated the results of SK procedure in 21 patients with posttraumatic lesions of the DRUJ at a mean follow-up of 3.4 years. Based on their report, the subjective outcomes were excellent in eight, good in six, satisfactory in two, and poor in five patients. Pronation and supination averaged 87% of the contralateral side in their patients. Similar to our results, grip strength of the injured hand averaged 55% of the contralateral hand in the study of Voche et al. (13). Failure of the SK procedure has also been reported frequently (14-17). Based on the report of Gordon et al., the SK procedure could be considered as an effective treatment for patients with some combination of post-traumatic DRUJ disorders including arthritis, instability of the distal ulna, and ulna-plus variance (12). Our study had some limitations. The main limitation of this study was the limited number of cases that did not allow additional statistical evaluation of the data. Moreover, comparison of pre-operative and post-operative forearm range of motion could have resulted in more valuable information. However, as the data were collected retrospectively, the data of pre-operative range of motion were not available. Altogether, our results show that the SK procedure could result in acceptable outcomes for the management of post-traumatic DRUJ problems. Yet, it might compromise some indices of the forearm such as grip strength. Thus, patients should be informed of the limitations before undergoing the SK procedure. 1. Jupiter JB, Fernandez DL. 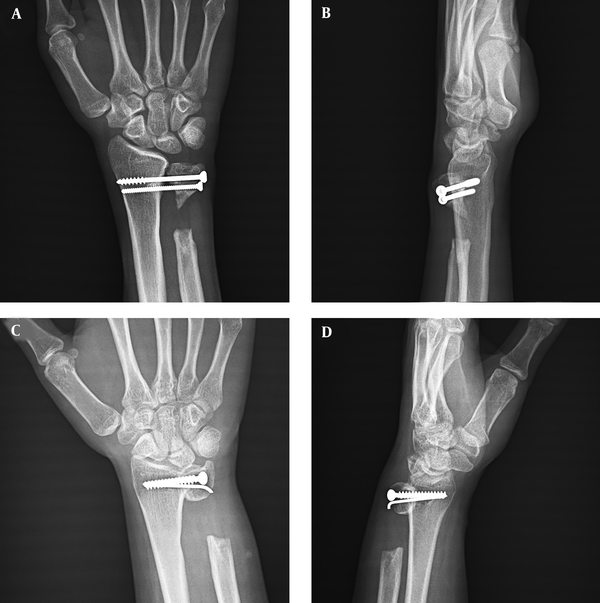 Complications following distal radial fractures. Instr Course Lect. 2002;51:203-19. [PubMed: 12064104]. 2. Lichtman DM, Ganocy TK, Kim DC. The indications for and techniques and outcomes of ablative procedures of the distal ulna. The Darrach resection, hemiresection, matched resection, and Sauve-Kapandji procedure. Hand Clin. 1998;14(2):265-77. [PubMed: 9604158]. 3. Carter PB, Stuart PR. The Sauve-Kapandji procedure for post-traumatic disorders of the distal radio-ulnar joint. J Bone Joint Surg Br. 2000;82(7):1013-8. doi: 10.1302/0301-620X.82B7.10674. [PubMed: 11041592]. 4. Kawabata A, Egi T, Tsuboi H, Takeuchi E, Fujita S, Masada K, et al. Modified Sauve-Kapandji procedure for rheumatoid wrists: A long-term study with a minimum follow-up of 5 years. Mod Rheumatol. 2014;24(3):426-9. doi: 10.3109/14397595.2013.843742. [PubMed: 24252031]. 5. Mazzer N, Barbieri CH, Martins MMPT, Souza AG. [Tratamento dos desarranjos da articulação radio-ulnal distal pela técnica de Sauvé-Kapandji. Resultados preliminares]. Acta Ortopédica Brasileira. 2001;9(1):12-20. Portuguese. doi: 10.1590/s1413-78522001000100002. 6. Sauvé L. [Nouvelle technique de traitement chirurgical des luxations recidivantes isolees de I'extremite inferieure du cubitus]. J Chir. 1936;47:589-94. Japanese. 7. Lluch A, Garcia-Elias M. The sauvé-kapandji procedure. Principles and practice of wrist surgery. Elsevier; 2010. p. 335-44. 8. Taleisnik J. The Sauve-Kapandji procedure. Clin Orthop Relat Res. 1992;(275):110-23. [PubMed: 1735199]. 9. Jacobsen TW, Leicht P. The Sauve-Kapandji procedure for posttraumatic disorders of the distal radioulnar joint. Acta Orthop Belg. 2004;70(3):226-30. [PubMed: 15287401]. 10. Bradway JK, Amadio PC, Cooney WP. Open reduction and internal fixation of displaced, comminuted intra-articular fractures of the distal end of the radius. J Bone Joint Surg Am. 1989;71(6):839-47. doi: 10.2106/00004623-198971060-00007. [PubMed: 2745480]. 11. Breen TF, Jupiter JB. Extensor carpi ulnaris and flexor carpi ulnaris tenodesis of the unstable distal ulna. J Hand Surg Am. 1989;14(4):612-7. doi: 10.1016/0363-5023(89)90176-7. [PubMed: 2754191]. 12. Gordon L, Levinsohn DG, Moore SV, Dodds RJ, Castleman LD. The Sauve-Kapandji procedure for the treatment of posttraumatic distal radioulnar joint problems. Hand Clin. 1991;7(2):397-403. [PubMed: 1880173]. 13. Voche P, Van Overstraeten L, Merle M. [Correction of posttraumatic disorders of the distal radio-ulnar joint with the Sauve-Kapandji surgical procedure]. Rev Chir Orthop Reparatrice Appar Mot. 1993;79(6):464-72. French. [PubMed: 8066298]. 14. Rotsaert P, Cermak K, Vancabeke M. Case report: Revision of failed Sauve-Kapandji procedure with an ulnar head prosthesis. Chir Main. 2008;27(1):47-9. doi: 10.1016/j.main.2007.12.001. [PubMed: 18314373]. 15. Fernandez DL, Joneschild ES, Abella DM. Treatment of failed Sauve-Kapandji procedures with a spherical ulnar head prosthesis. Clin Orthop Relat Res. 2006;445:100-7. doi: 10.1097/01.blo.0000205901.13609.70. [PubMed: 16601411]. 16. Coughlin TA, Cresswell T. Revision of failed Sauve-Kapandji procedure for Madelung's deformity with an unusual anatomical variant. J Hand Surg Eur Vol. 2011;36(2):158-9. doi: 10.1177/1753193410385045. [PubMed: 21285237]. 17. Ross M, Thomas J, Couzens G, Coleman S. Salvage of the unstable Sauve-Kapandji procedure: A new technique. Tech Hand Up Extrem Surg. 2007;11(1):87-92. doi: 10.1097/bth.0b013e318033b537. [PubMed: 17536530].